A balance of healthy eating, modified training exercises, and the necessary mental and emotional break help you stay on track and bounce right back when you return. 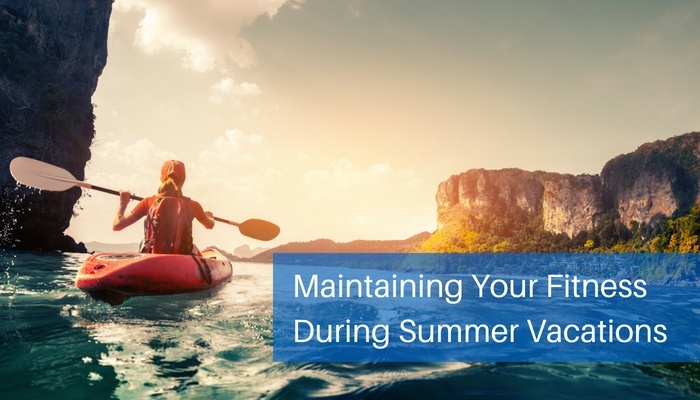 If you are not prepared for a vacation with a plan in place, the thought that you will gain weight can set you up for failure when you return, carving away at your drive. With tricks you can use before, during, and after your vacation, you are armed and ready to enjoy summer! Bodyweight training, Pilates and yoga are often overlooked when you are in the heat of your training regimen. Consider a combination of push-ups, squats, and bench presses. Now is the time to focus on these. And get your work-out in early each day so it doesn’t cut into your precious vacation schedule. Cardio workouts are the most difficult to maintain while on vacation, but you don’t have to give up respiratory training. To help maintain respiratory fitness, your PowerLung device is likely to be your ultimate travel fitness device. Available in four different models based on your fitness level and goals, there is a product designed for your specific needs. Now is the time to invest in a few inexpensive pieces of equipment (if you don’t already have them) to take along; hand weights, jump rope (an effortless way to get cardio in a small space), and resistance bands all enable you to keep fit in a hotel room. Be sure to check out the hotel’s fitness room online before you fly; many chains boast complete gyms ready for your use, and some even offer exercise kits, yoga mats and workout clothes! The lightweight PowerLung device can be stored and carried in a convenient waterproof case, making it the easiest exercise equipment to travel with! Seafood is always a good choice, and for many people, a delicacy not enjoyed every day at home. Grilled and broiled options are best and go easy on the heavy sauces. Choose a light breakfast filled with lean protein fresh fruits. Avoid the free hotel breakfast, which is notoriously carb-loaded and lacking on simple produce. Drink lots of water; traveling can cause dehydration, leaving you vulnerable to sickness, and an unnatural eating schedule can lead you to make poor food and drink choices. Additionally, water fills you up and offsets some of the other indulgences you need to experience while on vacation! Don’t be afraid to try local foods. The adage “everything in moderation” works here. Share meals, eat your largest meal during the day, and go light in the evenings. If you follow the 80/20 rule, where 80% of your food choices are healthy and 20% are indulgences, you won’t get behind the 8-ball. You can save money, calories, and still enjoy the cuisine. Avoid the mini bar and don’t over-indulge. Alcohol hides a lot of calories without offering any nutritional benefits, so watch closely what you are drinking. Clear drinks are often lower in sugars, while beers are carb-filled. Drink a glass of water for every drink to slow yourself down, and mix club soda to “water-down” your drinks whenever it won’t hurt the taste. Make exercise part of every trip you take by sightseeing by foot whenever possible. Look for bike tours in historic cities, whether guided or not. It’s a terrific way to get some fresh air, exercise, and a unique tour. Take the stairs instead of the elevator, and instead of renting a car (and dealing with parking and fuel expenses), utilize public transportation, Uber or taxis for those situations where walking may not be an option. Even if your trip is historical, gastronomic, or cultural, you can still add a few physical activities to your trip. Swimming in the hotel pool, bicycle tours, and short hikes to see the local geography can all be added without taking away from the theme of your vacation. If you are traveling with kids, physical activity helps to balance the moments when you may be visiting a museum or historic site, when they need to be quiet and still. Vacations are notorious for not only causing a few pounds of weight but also for undermining your long-term fitness goals. Respiratory exercise improves metabolism, so you can offset some of this loss by maintaining a respiratory fitness program. Using the PowerLung while on vacation helps you to improve oxygenation, feeding your muscles, will allow you to return after a vacation relaxed AND ready to jump back into your exercise routine. The portable handheld PowerLung provides you with a combination of inspiratory and expiratory muscle training without the need for a gym or athletic facility. Take your PowerLung with you everywhere; it fits in your carry-on or suitcase in the convenient vinyl case, offering you a quick respiratory workout anywhere you want!